Nothing kindles democracy’s energies, anxieties, hopes, and frustrations like an election. The quality of an election can spell the difference between a cooking fire and an explosion. If a successful election can calm and focus a nation (e.g. Namibia 2015), a disputed election can tear it apart (e.g. Burundi 2015, Côte d'Ivoire 2010, Kenya 2008). With at least 25 African countries conducting national elections in 2016-2017,1 great attention is focused on electoral management bodies – typically national electoral commissions – as crucial players in electoral processes and in shaping public perceptions of how well democracy is working. Poor electoral management can enable election fraud and, even if it doesn’t swing an election, produce political alienation, public mistrust, protest, and violence. In 2016, we have already seen examples of unrest in Kenya, where opposition calls for electoral commission reforms using the hashtag #IEBCMustFall have sparked demonstrations and a violent reaction from security forces; in the Republic of the Congo, where election malpractices led to violent protests; and in Gabon, where bloody clashes erupted after President Ali Bongo claimed a widely disputed re-election victory. In Ghana, pre-election anxieties are high amid questions about the electoral commission’s revision of the voter roll for December’s election. Against the backdrop of history’s examples – in Africa and elsewhere – of tampering with voter rolls, suppression of competition and voter turnout, ballot stuffing, vote-buying, multiple voting, and manipulation of results, free and fair elections, agreed to in the African Union’s Charter on Good Governance and Elections, depend on competent election management supported by citizen sensitization efforts to build public confidence. Using 2014/2015 Afrobarometer data from 36 African countries, this analysis examines public perceptions of electoral management institutions and the quality of elections. Overall, public trust in national electoral commissions is moderate at best. Although a majority of citizens say their most recent elections were mostly free and fair, citizens express serious concerns about the fairness of vote counts, corruption during elections, and the safety of voters during campaigns and at the polls. Citizens’ views of electoral commission performance and election quality generally mirror the opinions of country experts found in international assessments. 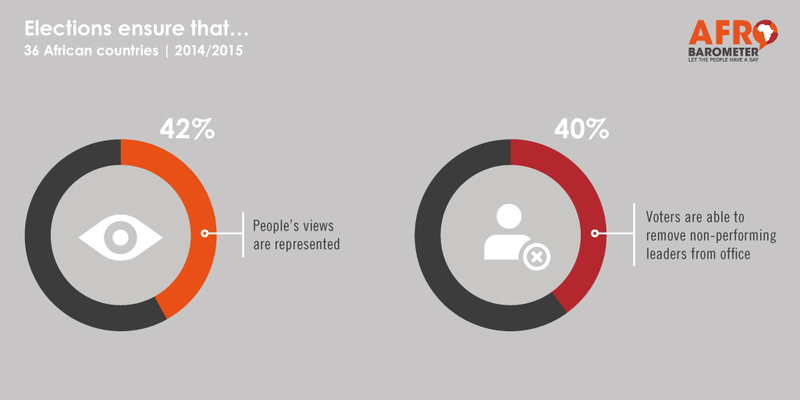 More broadly, many citizens say elections are not working well as mechanisms to ensure that people’s views are represented and that voters can hold non-performing leaders accountable. Few countries have achieved improvement in the perceived performance of elections over the past decade. Click 'Download now' for the full report. For the press release, follow this link.